Gozo Ferry Blues? Well, a bridge linking Malta to the tiny sister island of Gozo can be a solution...A cheaper one too considering it will save money on shipping costs, fuel, manning the ferry firm, etc. What do you think? Italy has chosen a winner for the 4.4bn euro ($5.3bn; £3bn) contract to build the world's longest suspension bridge that will link Sicily to the mainland. A group led by Italian construction firm Impregilo will start work next year and is expected to finish by 2012. Spanning the Messina Straits, the bridge will be almost 4 kilometres (2.5 miles) long and cut the two-hour journey time by ferry and train. The controversial project has been on the drawing board since the 1960s. 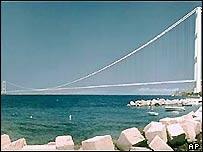 One of the biggest construction projects ever undertaken in Europe, the bridge has split opinion in Italy. Prime Minister Silvio Berlusconi has trumpeted the project as a vital driver of development in the south, which will finally make Italy one nation by linking Sicily to the mainland. The size of the project also will underline Italy's engineering prowess, polishing its somewhat tarnished image as a struggling economy and European problem area. For critics its is nothing more than a vote-winning white elephant that will waste billions of euros, and put further strain on Italy's already over-stretched state spending. They also point to the dangers associated with building a bridge in an area that has been hit by earthquakes. Whatever the outcome, there is no doubting the project's ambition. The bridge will carry a double six-lane highway and four tracks for a high-speed railway line. The other members of the winning group include Japan's Ishikawajima-Harima Heavy Industries, Spain's Sacyr Vallehermoso and a number of smaller Italian companies. Only one other group, led by Italy's Astaldi, was still in the running for the contract. Impregilo shares were suspended following the announcement, while Astaldi's fell more than 3%.